Walking around the ice on Lake Menomin I found a few items of interest. 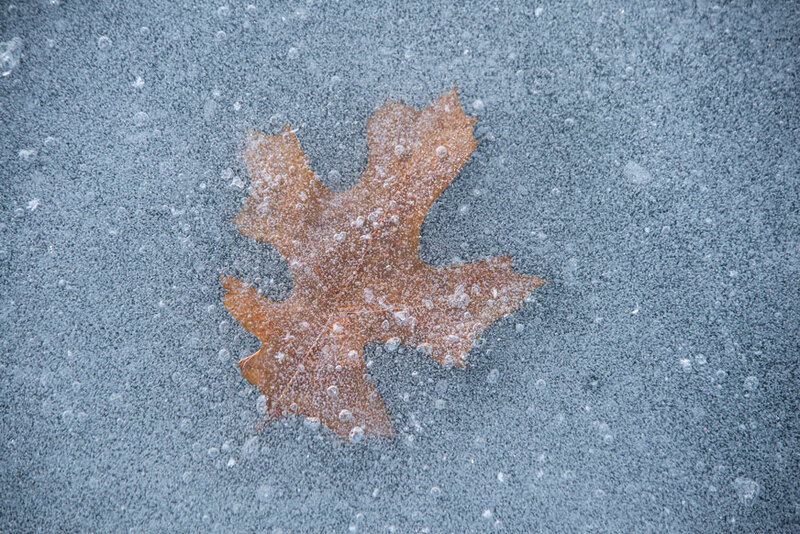 There were a few leaves on and embedded in the ice. 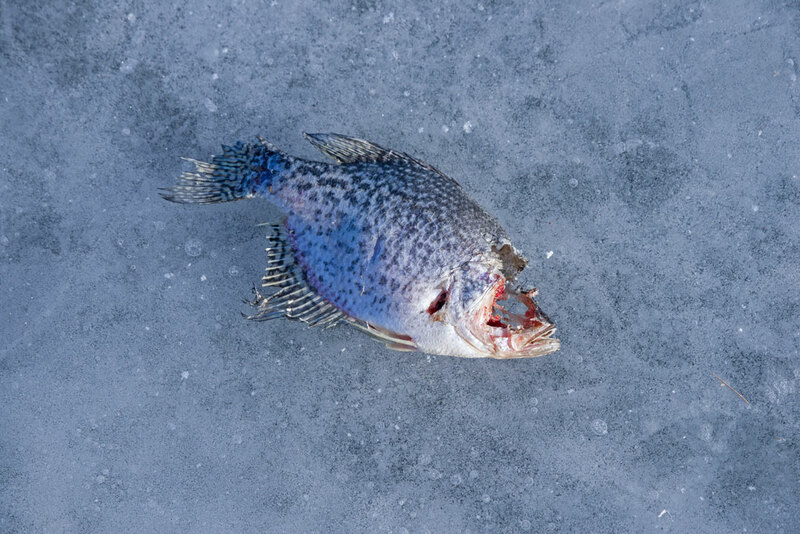 I found a partially eaten Crappie on the ice. Not sure where it cam from. Once when I was watching ice fishing the fishermen were throwing the fish out on the ice and a dog was picking them up and walking away with them. 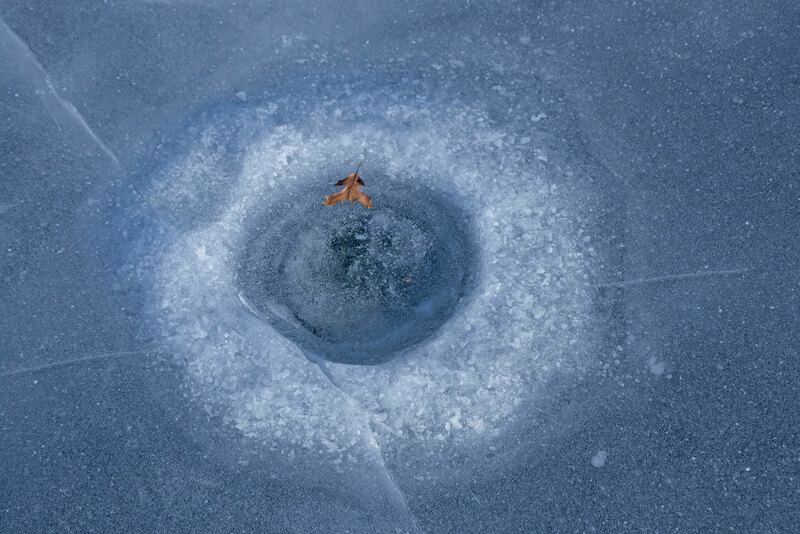 This is an old ice hole that was drilled in the ice and has since frozen over. 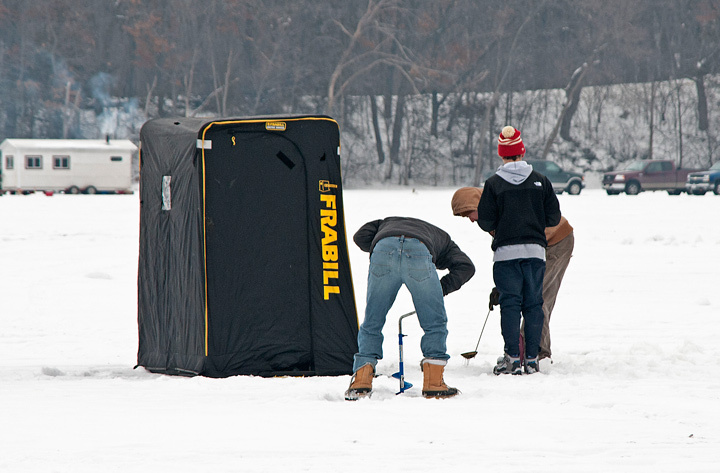 In Wisconsin ice fishing is a common winter sport. 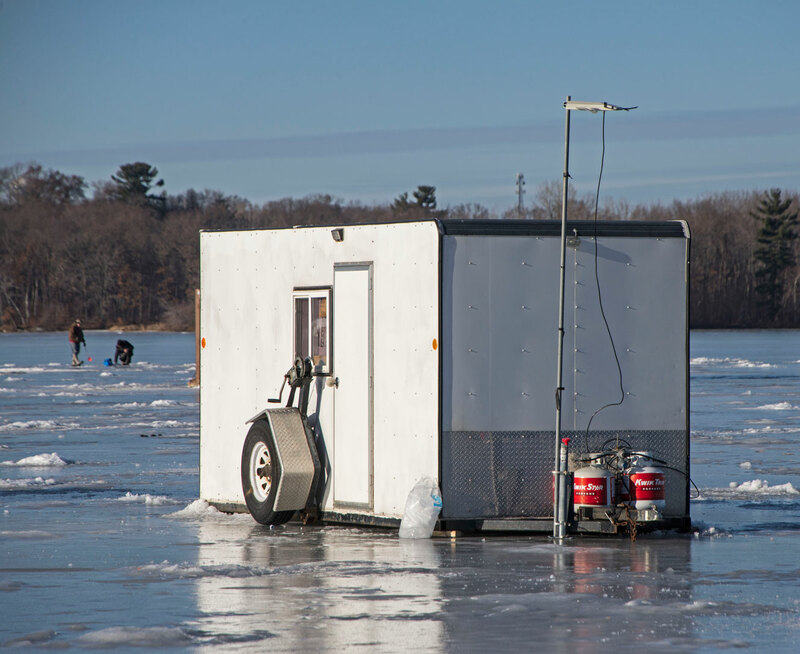 As soon as the ice freezes over ice fishermen can be found out on the ice. 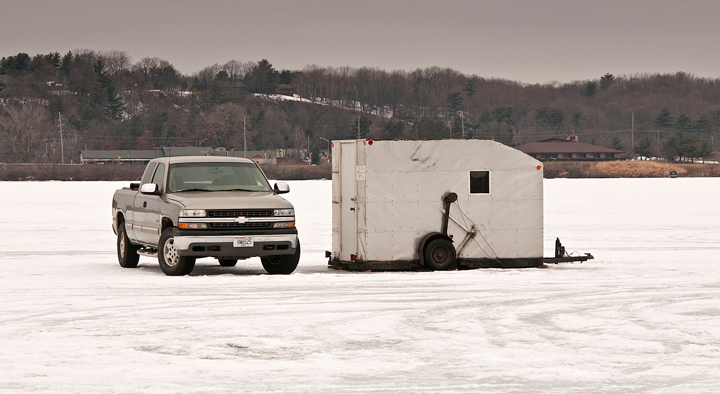 As the ice thickens and can support vehicles the fishermen drag ice shacks out on the lake. In the winter a small village can be found on the ice of Lake Menomin. I usually take at least one opportunity to wall through the village taking photos. This year it was particularly challenging to walk on the ice. Normally the ice is covered with snow but this year rained so the ice was very smooth and slippery. You will note that some of the ice houses are jacked up or placed on boards. This is done so the ice houses don’t freeze to the ice on the lake. If they do it makes it very difficult to remove them in the spring. 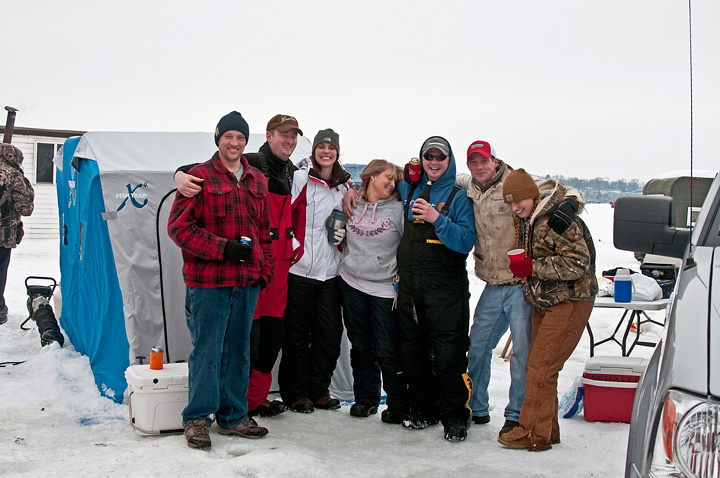 In the upper Midwest one of the favorite winter activities is ice fishing. This happens when the water on the lakes and rivers freezes and it is safe to walk on. 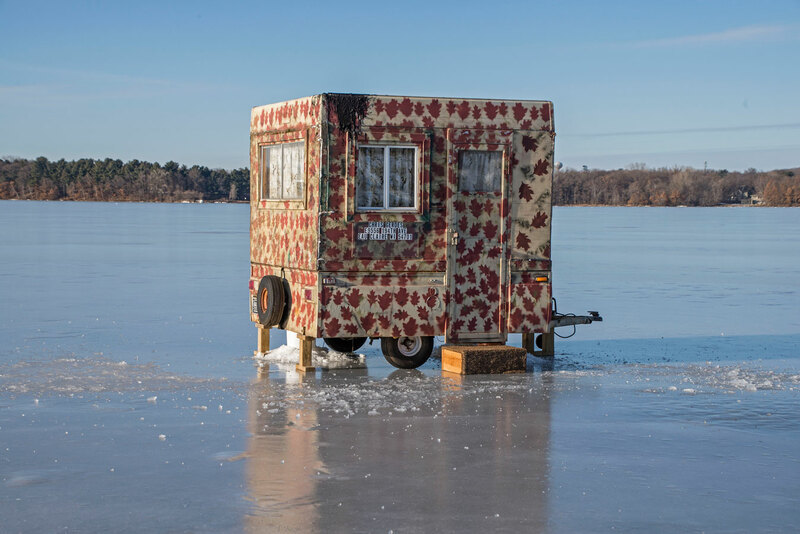 Once the ice is thick enough to support ice shacks small cities appear on the ice overnight. I usually take a walk around the lake in the winter photographing the ice shacks. There are all types of shacks on the ice. Most of them are homemade and others are commercially produced. This year was a little different from previous years. At one point we saw a car driving up and down the ice with a dog following it. Apparently the owner had figured out how to exercise his dog without getting any exercise himself. This shack was particularly interesting because it was falling apart and had garbage scattered all over the ice. There was a pile of beer cans beside the shack. One would like to think that the mess would be cleared up before the ice shack was removed but not everyone who enjoys nature really appreciates nature. 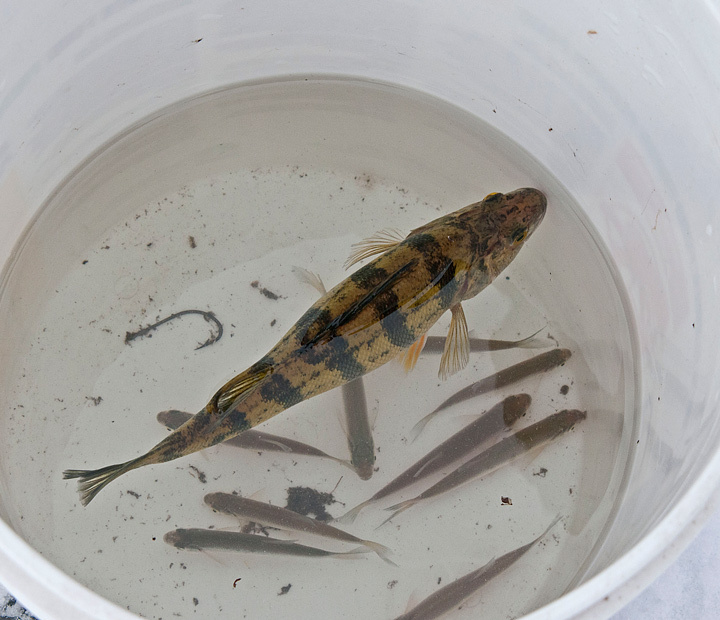 As we were looking at one of the shacks we noticed a fish on the ice. A dog came by an grabbed the fish and took off. The fisherman staggered out of his ice shack and we told him the dog had taken his fish be he didn’t seem to functioning too well and it took him a while to grasp the concept. Looks like this one was made from some garage doors. 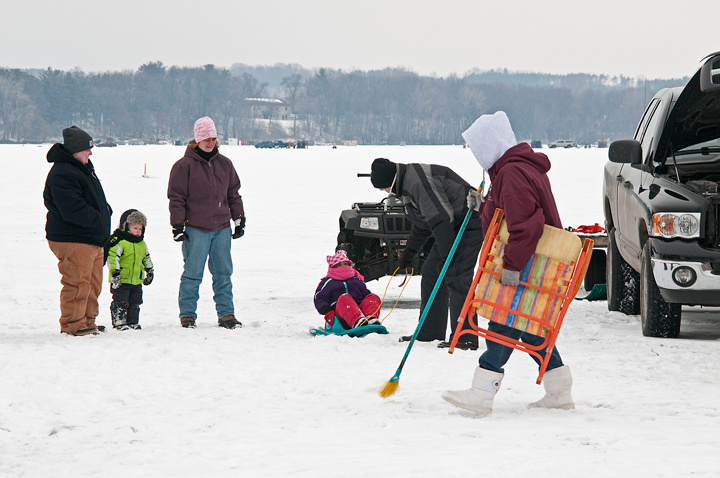 Even though there were three weeks before ice shacks have to be removed from the lake some people were already removing them. 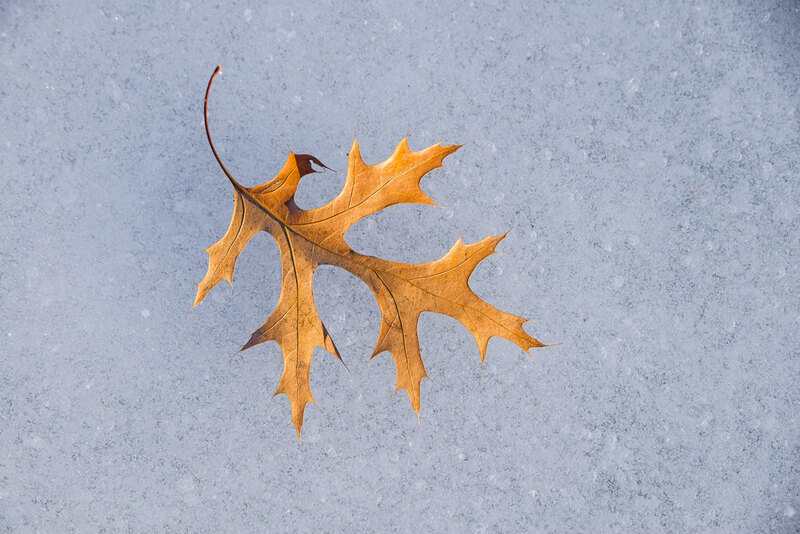 In fact, the next week all of them were gone because of the unseasonably warm weather. With the cold weather folks have been able to get out on Lake Superior to fish for Lake Trout. This past weekend a small city sprang up just off Brighton Beach. This is the second year in a row that folks have been able to fish on the big lake. We drove out to Brighton Beach and found a steady stream of fishermen headed out onto the lake. Getting out to the lake was difficult because there was a large pressure ridge just off shore. Fisherman had to work their way through a wide area of ice that looked like broken glass. We’ve been driving up the Minnesota North Shore for a number of years and this is the first year that We’ve see fisherman fishing on the ice at Brighton Beach. We couldn’t believe the number of fisherman out on the ice. It was if an entire city had sprung up overnight. In talking with one of the fisherman we found that many of them had been out on the ice since 3am. It didn’t seem that the fish were biting very well but this was probably one of the last weekends that fishing could take place out on the lake until the lake opened up and boats could be used. This was clearly the place to be this weekend. Yesterday strong winds caused the ice to shift resulting in 911 calls because fishermen were out on the ice. No assistance was required but the fishing season is over for this year. I woke up about an hour before sunrise to drive down to Brighton Beach in Duluth, Minnesota to photograph the sunrise. The weather report the night before said cold but clear weather. As I drove out of the garage I noticed it was snowing. I thought about turning around but since I was already up I continued on to Brighton Beach. I could see lights out on the ice which meant the ice fisherman were already out on the ice. I could also see a sliver of clear sky on the far horizon so there was hope for at least a brief sunrise. As I walked on onto the ice I noticed that the cracks were about five times wider than they were the day before. Never-the-less ice fisherman were streaming out onto the ice. Some of them were going way out onto the ice. As I mentioned in an earlier blog we have a Japanese exchange student staying with us over Christmas break. In an effort to show him the joys of winter in Wisconsin we took him out to Lake Menomin on a beautiful warm sunny afternoon to check out the ice fishing activity. 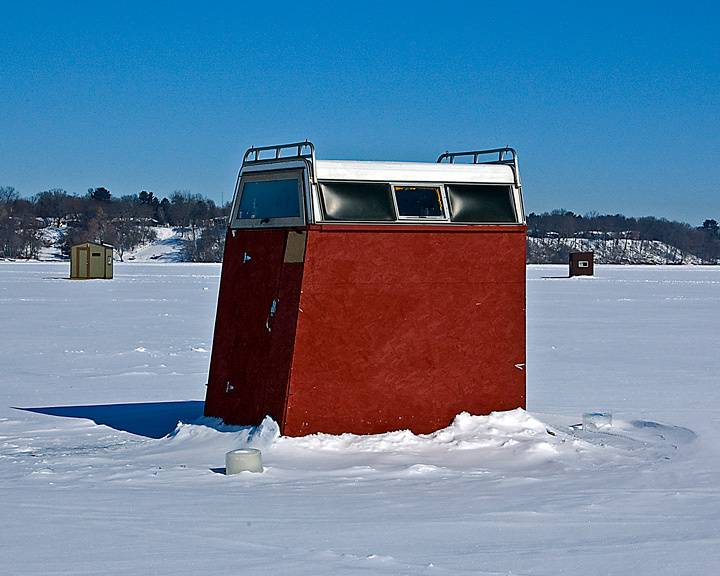 This winter I’ve notice an unusual number of ice fishing shacks on Lake Menomin in Menomonie, Wisconsin. I had been thinking for some time that I should get out and take some photographs of the activities. This past weekend there was a fishing contest so there was a little more activity than usual on the lake. In addition, we were scheduled to get a big storm the next day so everyone was trying to get their fishing in before the storm hit. 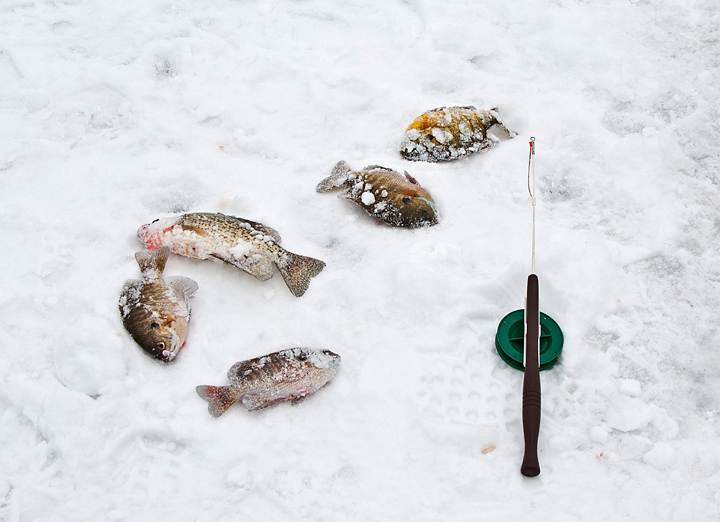 For those of you who don’t live in the northern climates, ice fishing is a major sport in the winter. Usually in early December the ice on the lakes freezes and once the ice is thick enough to support a fisherman’s weight people head out for the fishing season. 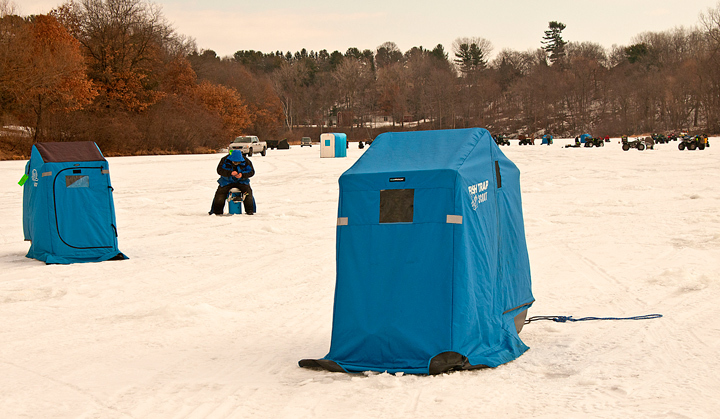 When it first starts and the ice is thin fishermen usually fish without a shelter or used a portable canvas shelter. 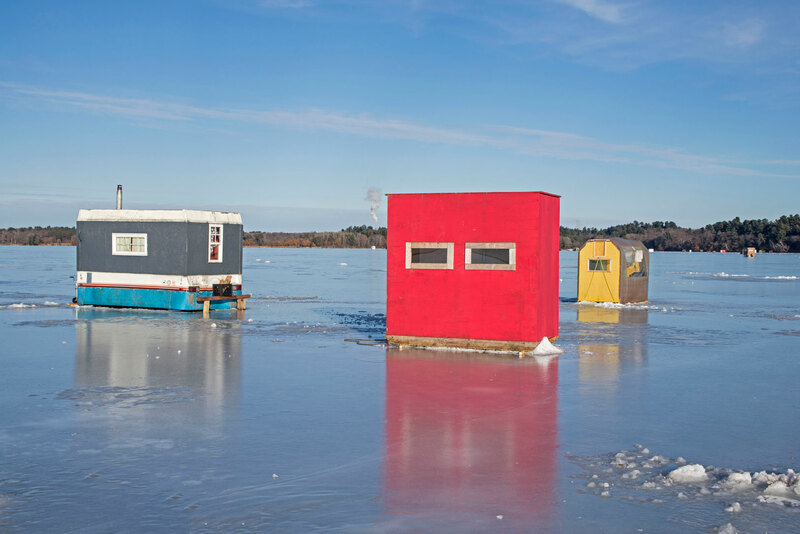 As the ice thickens they move their ice shacks out onto the ice creating large villages out on the lake. 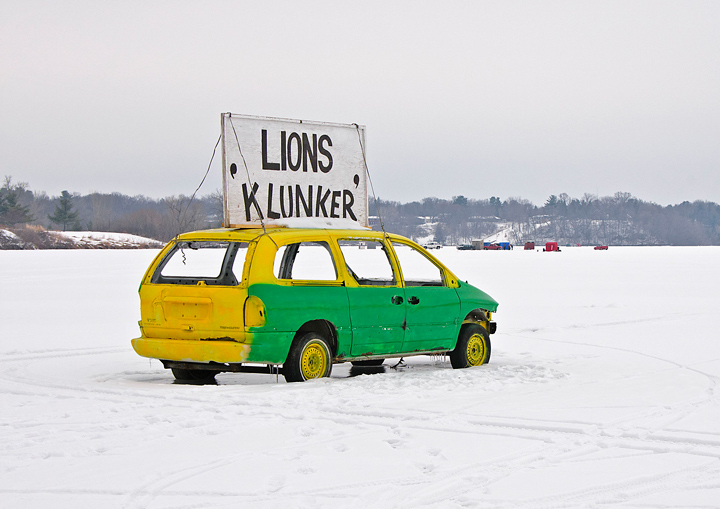 As I walked out onto the lake the first thing I encountered was the Lions Clunker that is parked out on the ice each winter. The local Lions Club holds a raffle each year with participants attempting to guess when the car will fall through the ice. On person closest to the day and time wins a prize. People have tried to put salt around the car so the ice would melt quicker. One time someone tried to use dynamite to make the car go down. As I walked among the Fishermen it was clear that fishing was very slow. I only found a few people with fish. One fisherman had some small sunfish and croppies. Another fisherman had a perch but it wasn’t much bigger than the bait fish in the bucket. I can tell you from personal experience on of the great thrills of fishing is waiting for the flag on the tip up to go up. You never know what is going to be on the other end on the line. Hear a couple of fellows are checking their line. The tip up is marked with a cone so others out driving on the ice don’t run over it. As I was walking along taking photos someone hollered to me that there was a great picture just around the corner. I was anticipating a fisherman with a large catch but it turned out to be a happy group of young people that just wanted their picture taken. I obliged them after they stumbled out of the tent. When I asked them where the fish were they mumbled something about not having a line in the water. As I walked around the tent I saw why they were so happy and what the main activity of the day was. 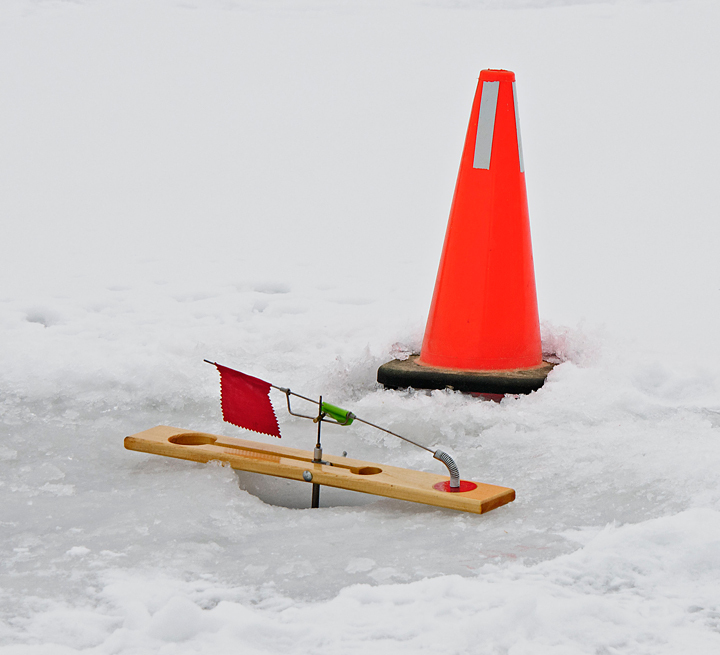 In order to fish on the ice you need to drill a hole in the ice. Most people use power augers so they can drill a lot of holes quickly. Unfortunately these fellows just had a manual powered auger and it looks like the ice was fairly deep. 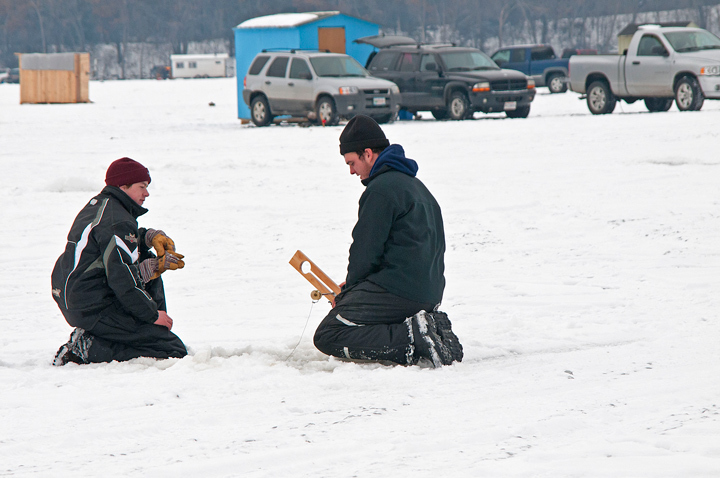 Ice fishing up north is frequently a family affair. When the fish aren’t biting the kids need to be entertained so a sled ride was in order. Not everyone can afford a fishing shack. Some folks just head out to the lake with their lawn chairs. Just another day at the beach only they are on ice and the temperature is in the teens. 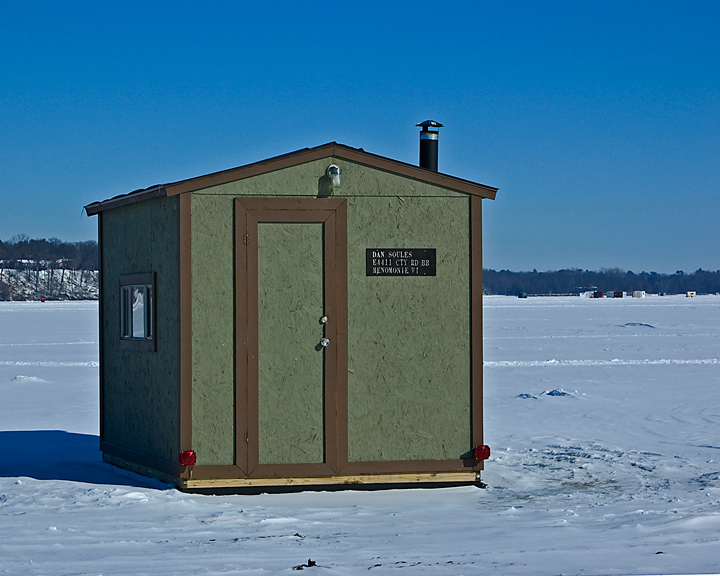 I was reminded that all of the ice fishing shacks had to be removed from Lake Menomin last week. 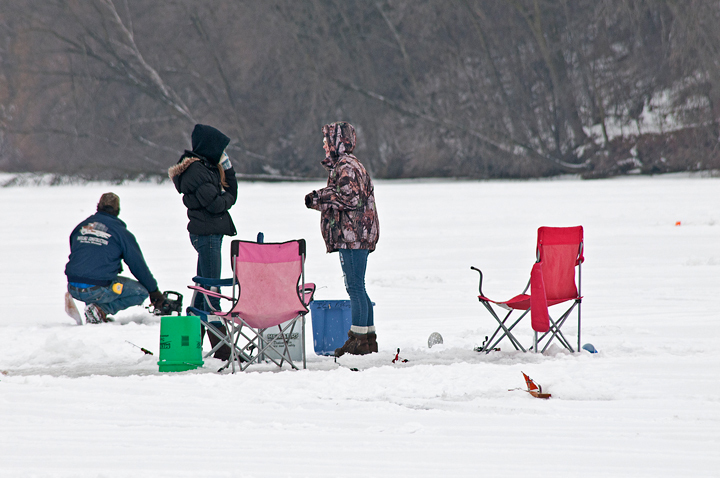 Ice fishing is probably a bit foreign to most of the country but is a common sport and sight up north. During the winter I usually walk around the lake photographing some of the fishing shacks. As the ice thickens a small city sprouts up on the ice. 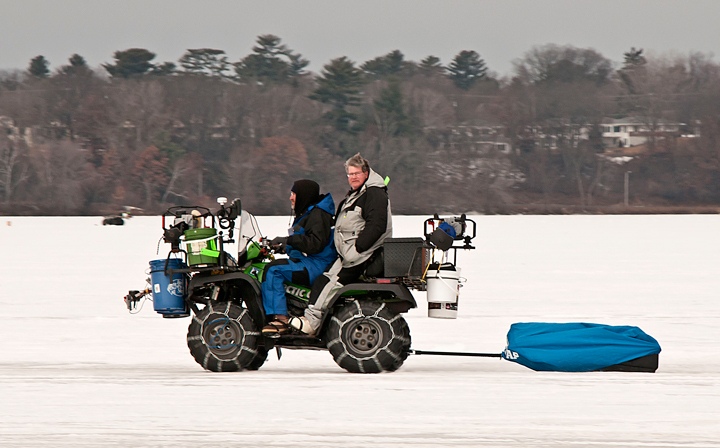 Once the ice forms on the lake people start heading out to fish. Fishing is always best when the ice is thin. That’s probably why we have people and cars falling through the ice every year. 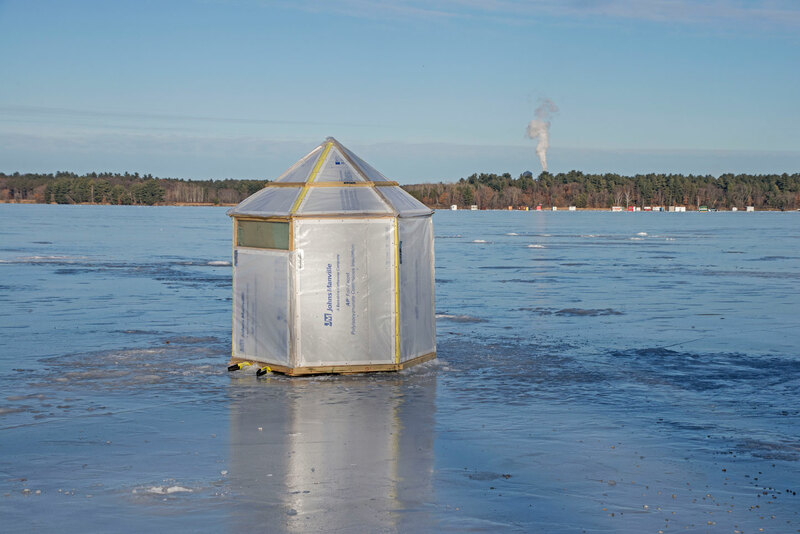 There are a variety of ice shacks on the ice. 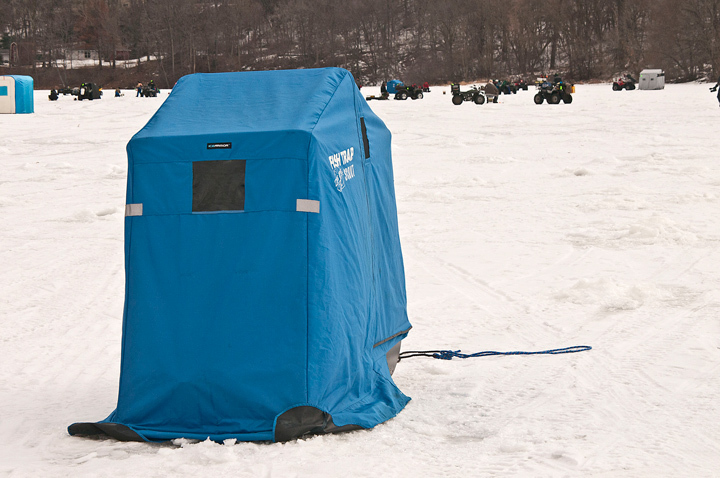 Some are no more than portable tents that are designed to provide shelter but are easy to move around on the ice. They are usually removed at the end of the day. Some folks are creative in designing their ice houses. This one is made from wood and a truck topper. 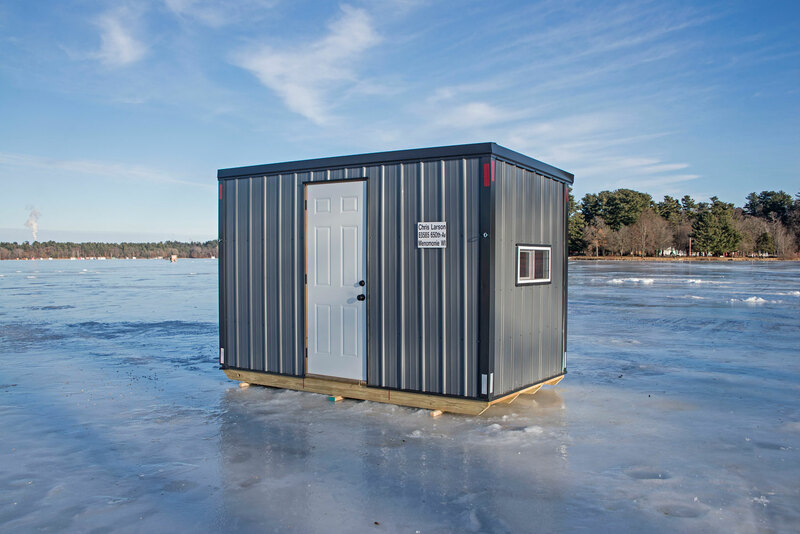 More and more there are top of the line commercial ice fishing shacks to be found. They are driven out on the ice at the start of the year. The wheels can be raised and the house set on the ice. 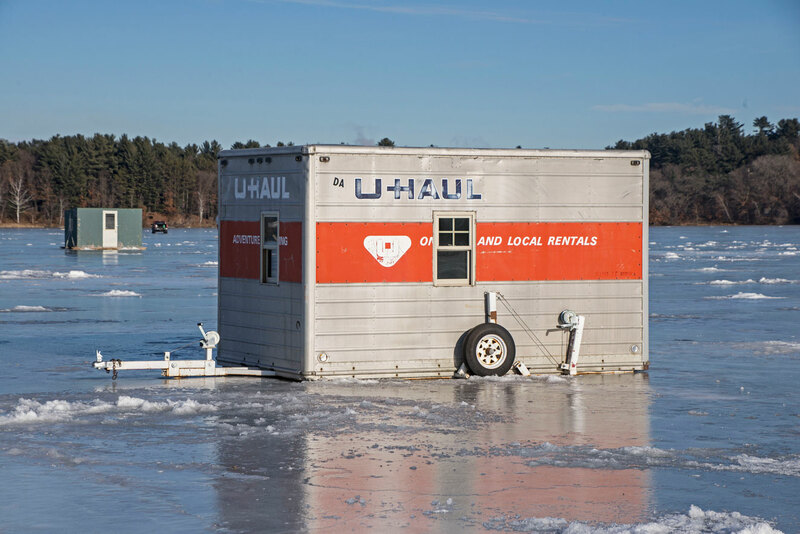 When it comes time to move or remove the ice house the wheels are lowered and the house is driven off of the ice. More ice shack photos can be found on my website. 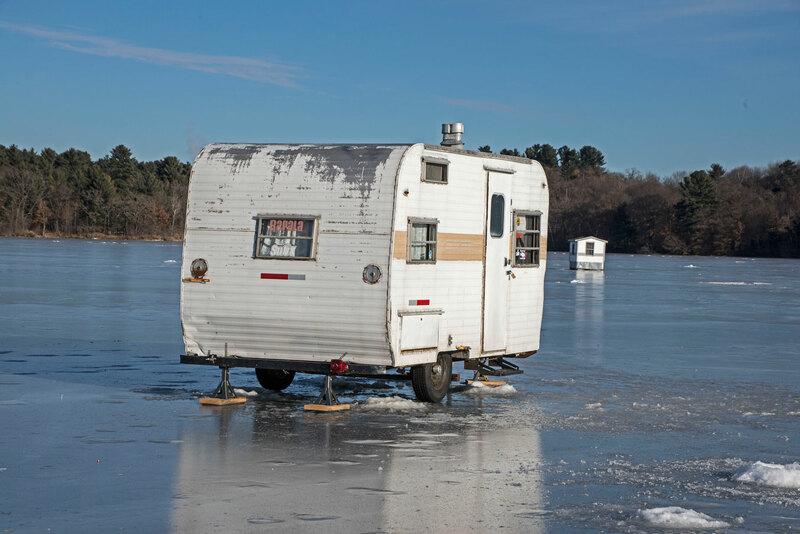 Ice fishing is probably a topic that is alien to most parts of the country and most people probably find it hard to believe that someone would actually walk on ice let alone fish on ice. I remember a number of years ago I was working with a group of people from Kansas City. We were looking out my office window and for some reason I mentioned that I went ice fishing on the lake we could see from my window. I couldn’t get them to believe that people actually fished on Ice. The thought I was pulling their leg. It’s really a lot of fun and you don’t need a lot of equipment. I usually have a couple of cheap ice fishing rods, an hand auger to drill a hole in the ice, a bucket carry thing in and sit on, some bait usually waxies and my kids sled to pull it all out onto the ice. Of course that’s cheap me. 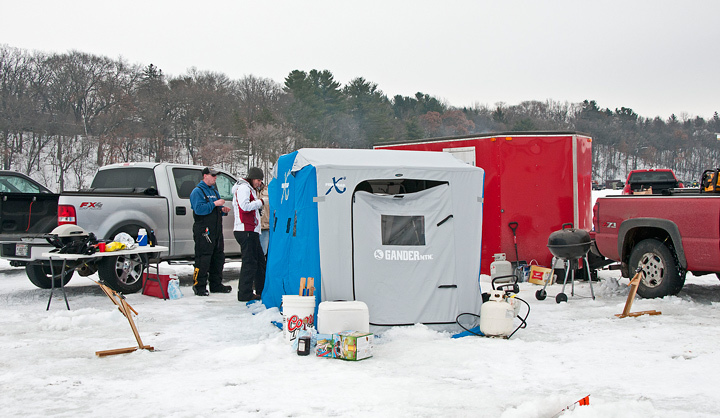 This past weekend the North American Ice Fishing Circuit held a tournament in Menomonie on Lake Menomin in Menomonie, Wisconsin. My wife and I drove past the lake on Saturday and noticed a lot of activity on the ice. There was a kick ball tournament and a number of the tournament fishermen scouting locations. The total purse was for the tournament was $21,000. On Sunday my wife and I drove into town to check out the activity. These fellows were serious fishermen. Most of them had specially rigged ATV’s to carry their gear. Their buckets were rigged so they could pick up their bucket, pole, fish finder etc. all in one motion. 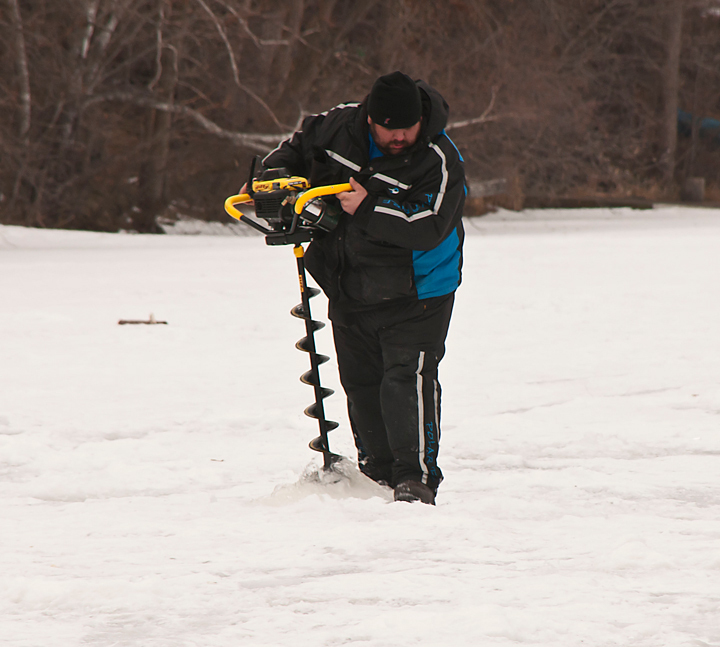 when they arrived at a fishing spot they jumped off their ATV and started drilling multiple holes with their gas powered ice augers.